Scheduled for the week-end of October 26-28, 2007, HASE was build up around the X-Prize Competition at Holloman AFB and seemed to be the perfect starting point for my trip to the US, of which more will follow later in the 'Trips' section. 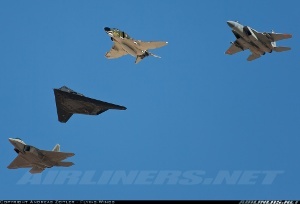 The F-117A Nighthawk was the aeronautical highlight for the fans and its presence dominated the show, let alone that a 3-ship formation of this aircraft is surely not a common sight at other airshows. This was unfortunately only presented on Saturday, as only 2 aircraft took off on Sunday for the role demonstration. During this display the aircraft took off, showed several formation fly-bys and then splitted up to cross the show center at exactly the same time from different direction. A tactic commonly applied during combat and an impressive sight to see this precision. 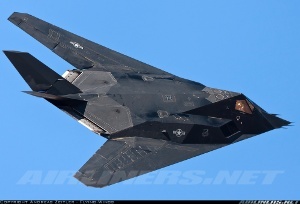 Compared to aircraft developments nowadays the one of the Nighthawk unbelievable fast. After the contract award to Lockheed Martin in 1978, their Advanced Development Projects, the "Skunk Works," brought an aircraft based on completely new technologies to the first flight after only 31 months on June 18, 1981. Deliveries of 59 aircraft then took place between 1982 and 1990. 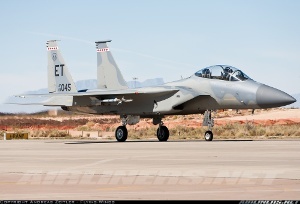 This, however, remains highly unlikely, as the first 10 aircraft have been flown into storage to Tonopah in 2006, and the last ones followed on April, 21st 2008, bringing the Nighthawk's era to an end. 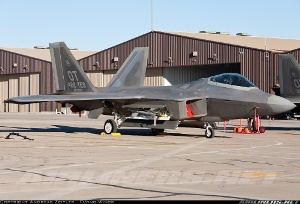 The successor of the F-117A at Holloman from June 2008 on, the F-22 Raptor, was also on display at the show. 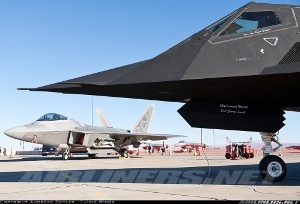 One aircraft was placed in the static display directly next to the F-117 and allowed a nice comparison between the different generation of stealth technologies used on the aircraft. Ground crew and pilots gave out information as far as possible as well, and Lockheed Martin surprised with many nice give-away articles. 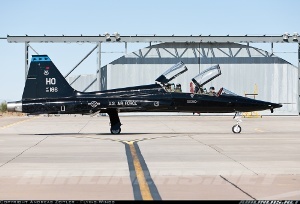 During the flight display the jet showed several fly-bys but not a real display, as it was not flown by the official display pilot, however the vertically climb to 40,000 feet in less than a minute by the Raptor directly after take-off most impressive. As much as the clear air that made it possible to still see the aircraft as a small dot leading the contrail when it reached its final altitude. After the Boeing/Bell XV-15 Tiltrotor the CV-22 Osprey was still an awesome sight demonstrating the unique tiltrotor properties: taking off like a helicopter and flying like a normal aircraft after the transition phase. 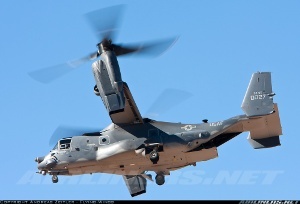 For its display the 58th Special Operations Wing (SOW) CV-22 Osprey was flying in from the nearby Kirtland AFB and showed several fly-bys and hovering manoeuvres, kicking up a lot of dust from the ground. Other USAF demonstrations included furthermore the F-16C West Coast Demo Team and the USAF Heritage Flight, as well as a B-1B fly-by on Saturday as well as a nice C-130 pass after the parachutist demonstration. During the afternoon suddenly a jeep appeared in the field on the other side of the taxiway opposite of the spectator area, and accompanied by the sound of "Bad Boys" of Bob Marley a Border Patrol UH-60 Blackhawk arrived to take out the "Bad Boys", apparently coming from the country just south of the border of nearby El Paso. The demo was entertaining nonetheless, especially due to the music and the helicopter posing in different positions, though backlight was a bit distracting. And even the commentator didn't hesitate to use his words "When you're on the wrong side of the fence, you're on the wrong side of the law", with which he also remembered the crowd several time during the show not to surpass any fences. The usual mix of aerobatic and warbird acts was self-evidently also present at the show. An original AT-6 of the Tuskegee Airmen ("Double Vee" and a beautifully polished B-25 were the main warbird highlights, Red Bull was also present with the Bo105 helicopter demonstration and the MiG-17 and furthermore several aerobatic acts made the time pass by very quickly. Nice to see was especially the precise formation flying of a team using three T-28 Trojan. 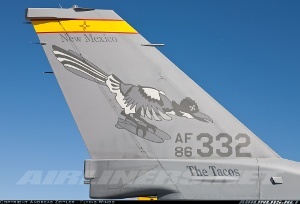 The static display at Holloman was not very numerous, it offered however several nice highlight as a UAE F-16E Block 60 or another New Mexico ANG "Los Tacos" Fighting Falcon with a funny bird on the tail. An exotic aircraft in the display was a Tornado as a sign of the Luftwaffe's sstrong presence at Holloman. 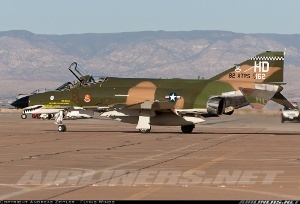 The jet was even foreseen to participate in the flight display, but this was unfortunately denied by the headquarters in Germany. The interested wisitors were able as usual to walk through the E-3A AWACS or the C-5 Galaxy, though strangely there were no queues on Sunday morning as a lot of visitors probably did not rush to be early on the site. Verdict: Though the show has been mainly build up around the X-Prize competition, USAF hardware did not get a raw deal and was presented properly. 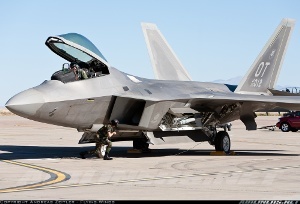 With the decommissioning of the F-117A in April 2008 this might also have been the last public demonstration of the Stealth Fighter in a bigger scale and 'Team Stealth' took care to leave a lasting impression! The military flying display made sure that quality overruled quantity, though the German Tornados were sadly missed and the ground exhibition was not overpacked with aircraft and left some places to move around freely as well as to find always a nice spot along the fence. A very nice event with excellent weather conditions, though the backlight makes photography very difficult and not always very satisfying. 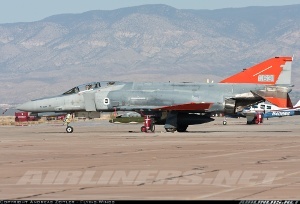 And I want to conclude this report with the final words of both showdays, after the Phantom had landed and the commentary was over: "Phantoms Phorever!" Besides the AF activities the were also presented the X-Prize Cup featuring the Northrop Grumman Lunar Lander Challenge. It is designed to accelerate commercial technological developments supporting the birth of a new generation of Lunar Landers capable of ferrying payloads or humans back and forth between lunar orbit and the lunar surface. Such a vehicle would have direct application to NASA's space exploration goals as well as the personal spaceflight industry. The flying part of the challenge was held around midday, but whereas several competitors were present in the static display and showed their constructions, only one team was really ready to fly: Armadillo Aerospace with their MOD, which is 12 feet tall, is a 1400 pound computer-controlled liquid oxygen rocket vehicle. It is guided by GPS and other aides. The Competition is divided into two levels. Level 1 requires a rocket to take off from a designated launch area, rocket up to 150 feet (50 meters) altitude, then hover for 90 seconds while landing precisely on a landing pad 100 meters away. The flight must then be repeated in reverse-and both flights, along with all of the necessary preparation for each, must take place within a two and a half hour period. Armadillo was able to fly their craft according to Level 1 rules on Saturday, but failed to repeat the flight for 7 seconds short during the giving time on the same day. The technical failure for this prevented furthermore a repetition on Sunday, leaving the $350,000 prize money ion the pot and open for the other teams as well. But it leaves the option open for the repetition of the competition in the future, hopefully in combination with another nice airshow.